A key question that news organizations face, particularly during intense periods like election years, is to what degree journalists should present the facts with some interpretation, giving their audience guidance in navigating all the information that comes at them. A majority of U.S. adults (59%) reject the idea of adding interpretation, saying that the news media should present the facts alone, a recent Pew Research Center survey found. Four-in-ten favor adding some interpretation to the facts. The survey of 4,132 adults on the Center’s nationally representative American Trends Panel was conducted Sept. 27-Oct. 10, before Election Day. 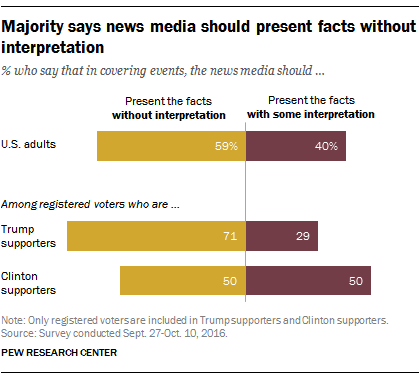 Although the public prefers the news media to present “just the facts,” they may not even agree on what the facts are. In the same survey, 81% of registered voters said that most supporters of Hillary Clinton and Donald Trump not only disagree over plans and policies, but also disagree on basic facts. There are substantial partisan differences over whether journalists should include interpretation in their stories. Registered voters who supported Trump for president favored a “just the facts” approach by more than two-to-one, with only 29% saying the news media should add interpretation. Clinton supporters, on the other hand, are evenly split on the issue, with half against interpretation and half favoring it. This may be linked to a perception among Republicans that coverage of their candidate had been too tough. Among Republicans, 46% thought coverage of Trump had been too tough, while only three-in-ten Democrats thought the same of coverage of Clinton, according to Pew Research Center’s mid-September survey. One thing the public does approve of to encourage clarity in presenting the news: fact-checking. The vast majority of registered voters say that fact-checking is a responsibility of the news media. And even those who oppose interpretation of facts generally favor the fact-checking role of the news media. Fully 81% of U.S. adults who prefer facts without interpretation believe fact-checking is a major or minor responsibility of the news media. About the same share of those who prefer interpretation, 83%, think fact-checking is a responsibility. Taken together, this suggests the public may not see fact-checking as an act of interpretation. Since a majority prefer the news media to avoid interpretation, the public may be more likely to approve of the news media analyzing public figures’ statements when presented as fact-checking – using facts to either verify a piece of information or correct a piece of misinformation – rather than as analysis or commentary. Note: Survey methodology can be found here, and topline is available here (PDF).